In this long, long section I describe the process of the creation of the Saga Poster. If you are interested in tiny details, this is your place. If you are interested in the final picture, continue here. If you want to download it, go here. Note: the pictures on this page will open in a new tab to help you read the text and have a closer look at the images when you want. From the top left part to the top right the greens of Naboo transform to a burning red flame and finally arrive to the cold blue colors of the Empire. This line also represents Anakin’s fate: the way he transforms to Darth Vader. From the top left to the bottom left parts, there is another transition: from Naboo through Coruscant to Mustafar. 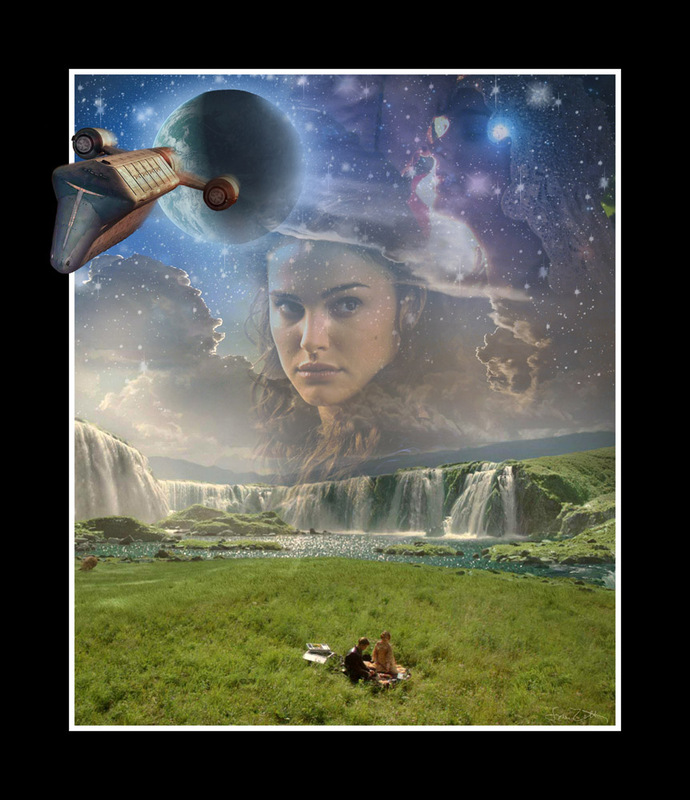 The first two planets represent the Republic in my mind: Naboo means peace and diversity (and also a symbol of Padmé, of course) while Coruscant is the shine, the greatness. But this shine is just a facade: below the buildings you can see the lava flows of Mustafar, representing the fall of the Republic. Obi-Wan stands protectively before Coruscant’s landscape: he is a Jedi knight, the guardian of peace and justice in the Republic. 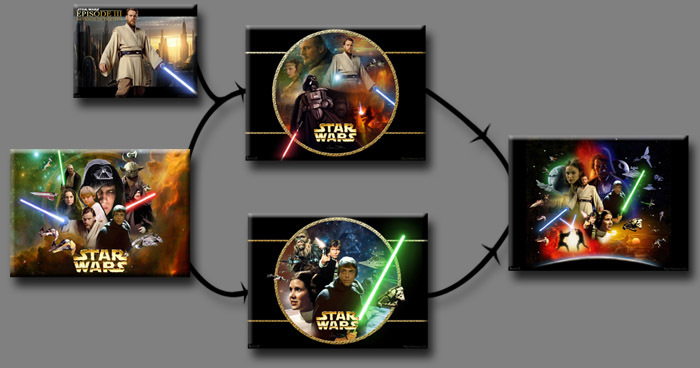 On the bottom two scenes are paired: the pure action of the duel of Anakin and Obi-Wan and the pure silence of Tatooine with the twin suns. The fall and the promise of a new hope. The spaceships on the left are following each other in the order of the prequel episodes (green-yellow-red transition). Imperial ships are placed on the top of the right side while Rebels are in the lower right part (blue-orange colors without transition because there should be no transition between Empire and Rebellion). This picture is a rare example of collages with mostly black background – in that time, I preferred multicolor backgrounds. I did so because I wanted to focus on the characters rather than the background colors – and there are many characters here. This is also my first picture where I used aura around the characters to describe their affiliations in a subtle way. This kind of “minimalism” (a hard word to my generally crowded pictures from that time – and an inappropriate word in today’s meaning) also appears in my logo choice: I wanted to avoid the full-gold version and use the movie version instead. Originally, I wanted to place the second Death Star behind Vader because I like it more than the first one (especially because the scenes with the Emperor). But, considering the anniversary I tried the Episode IV Death Star first and I liked it – so I kept it. Everything worked so well with the poster and I still had 23 days to the anniversary. Therefore I decided to do something bigger: I wanted to extend the poster sideways to depict more characters, not just the main ones. I had three weekends to do this. 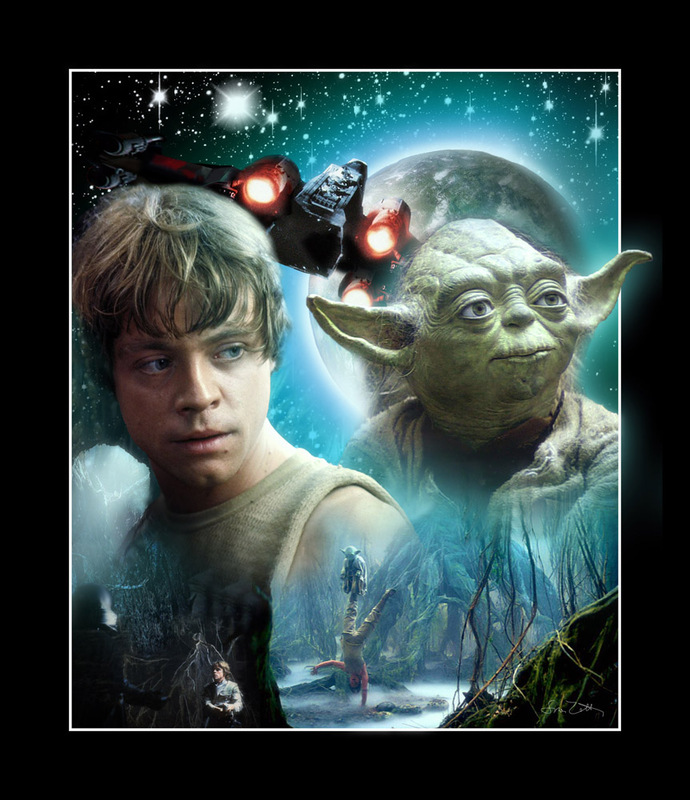 Yoda and the Emperor, the biggest focuses of the Light and Dark side of the Force were the first additions. The Emperor required his Throne Room as an obvious background so I added it. On the right side I kept the structure that bad guys are in the upper region (Boba, Tarkin, Piett, Jabba) while good ones are below then (Lando, Ackbar and a Zev as a random Rebel pilot). I closed the right part with ewoks and stormtroopers. The bottom parts were logic continuations of the Mustafar (Episode III) and Tatooine (Episode IV) scenes from the original images: I placed a Naboo landscape (Episode I) and Geonosis from Episode II on the bottom left parts while Hoth (Episode V) and Endor (Episode VI) went to the right side. All I had to do is to place more ships. But I felt something is still missing. The central arc of a planet (Tatooine) looked somehow weak to carry the weight of the giant collage. I decided to strengthen that part and I added one of my favorite scenes, the throne room celebration from the end of Episode IV. It has the most magnificent music, it is brilliant. And it has large columns of light – exactly what I needed. 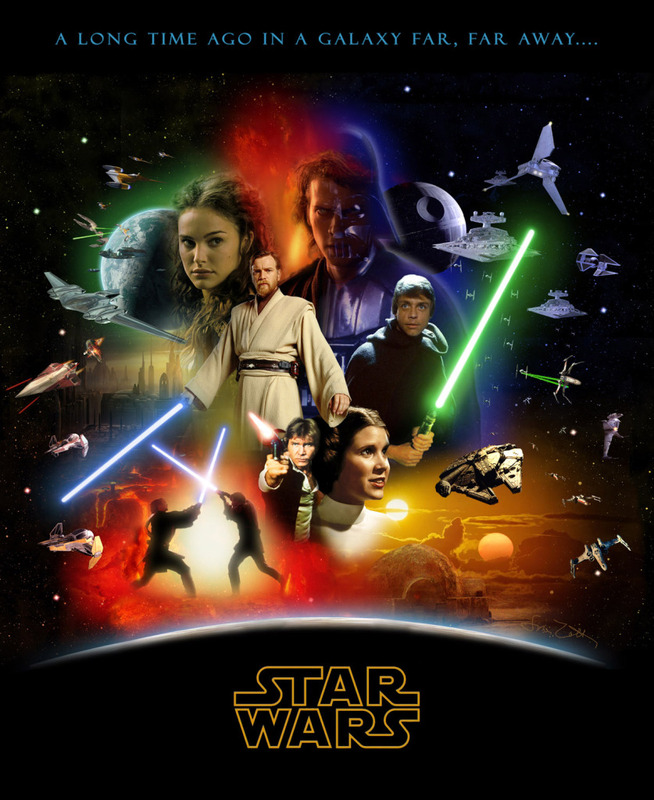 I placed the droids in the middle since they are the core elements of the saga and the middle orientation on this posters means higher importance. Finished! Almost. Now I had a lot of empty black space at the bottom. Therefore I designed placed custom episode logos. 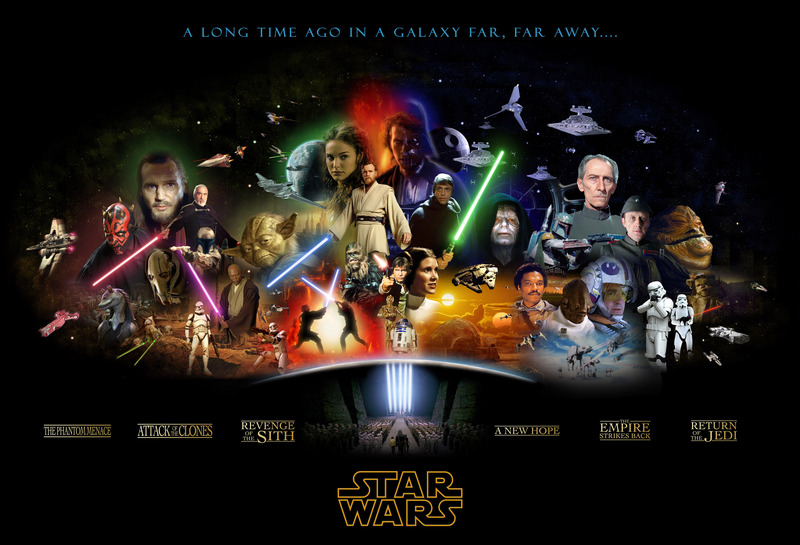 I made two versions and published the finished, extended Saga Poster on 25th May, 2007 – the date of the 30th anniversary of A New Hope. This piece has 30 figures – but this is a coincidence. But it was still not the end. This was the time of the Celebration Europe, the first official Star Wars event in the continent. Here I had an opportunity to participate as an invited Fan Artist. 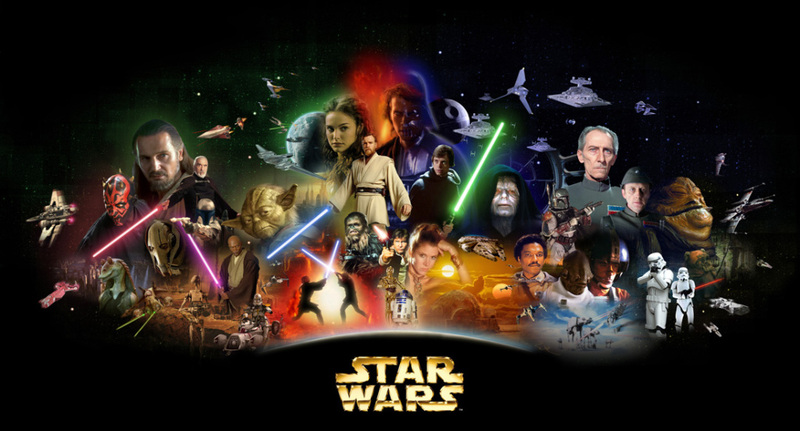 The Star Wars Saga Poster debuted here and it became very popular among the visitors. 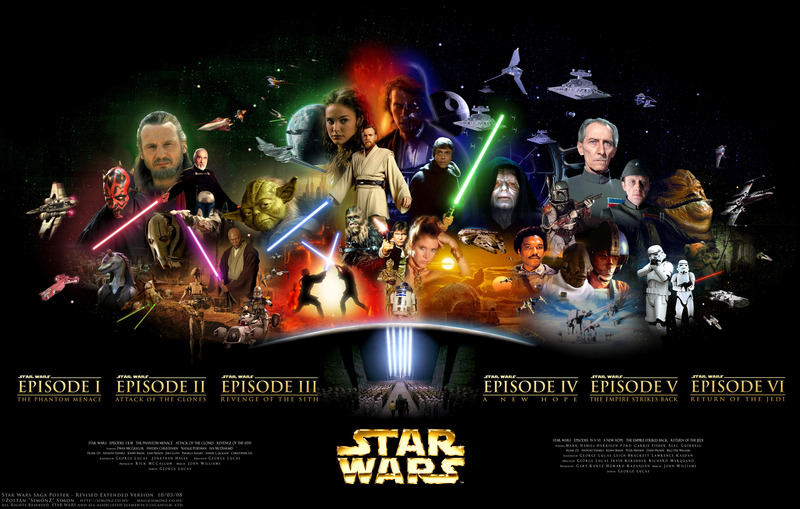 This was the month when the Saga Poster started its own way through the internet. As far as I see it started at FilmSchoolRejects where Neil Miller posted the image. Several weeks later he discovered my site, too. 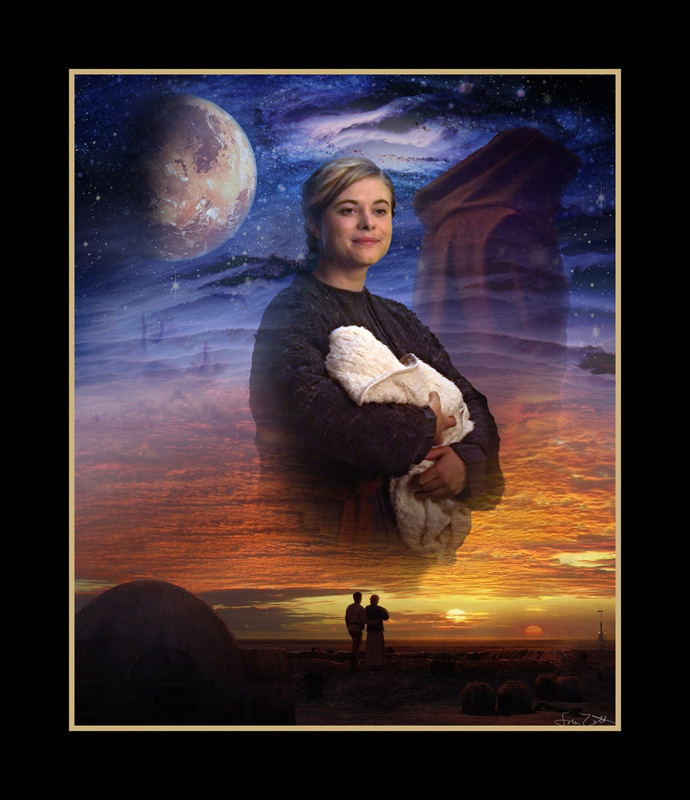 Naturally, most people just posted the Saga Poster without trying to find the original source. The picture received thousands of feedbacks. And I literally mean thousands. I read everything I was able to find. Based on the feedbacks, I created an updated version of the poster. In these weeks there was the first of the several attempts to officially publish the Saga Poster. Until now, none succeeded. Some of these were in my mind earlier, some of them were suggested by those who saw the picture, some of them were ordered by Lucasfilm (e.g. 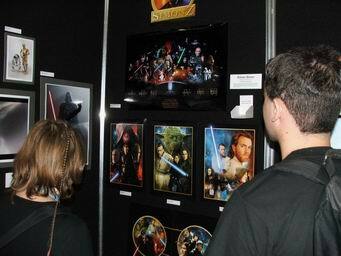 the flipping which was a bit funny because the official Revenge of the Sith poster depicted a flipped Obi-Wan). This third version did not reach such publicity as the second version. I published it on my site in March, 2008. … when Dorling Kindersley Publishing made the world’s largest LEGO mosaic image using the Saga Poster. You can read more about the event here. I suggest to check the event gallery as well. I created a fourth version for a Lucasfilm licensee. 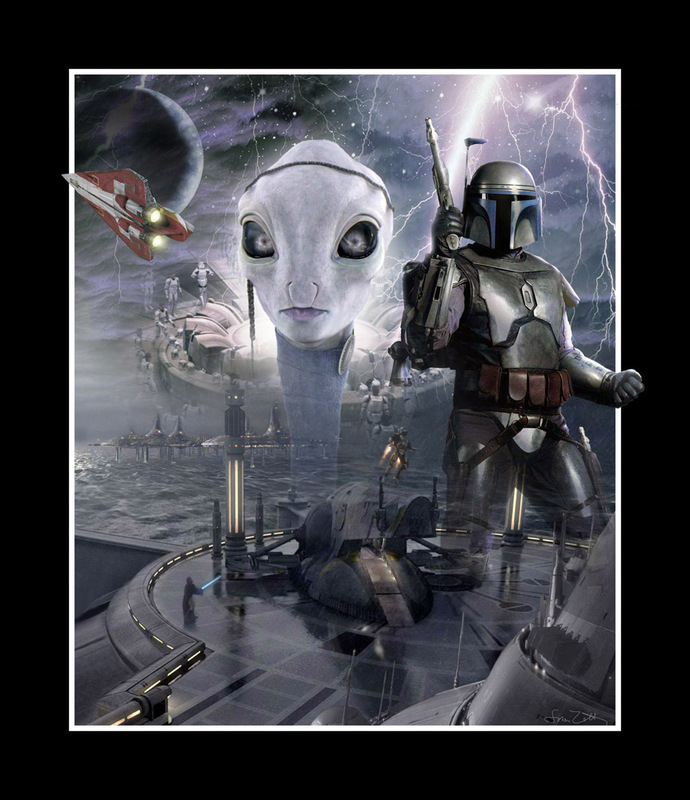 This time only minor changes were made: besides color and background corrections I placed Anakin’s pod to the left side. This is the picture you have seen on the top of this page.